Portrait of Kelly Guillory, photograph by Amanda Kane. Painter and graphic novel illustrator, author of Blood Money: The Road to Detroit. She has been very involved with the Detroit Design Festival from the beginning, and in 2012 was a driving force behind Hopscotch Detroit, a project that broke the world record for longest hopscotch course. 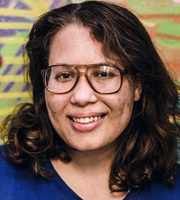 Other graphic novels in her portfolio include Odyssey, Transhuman Resources and The Other World; on some of these she also has a writer credit. Kelly Guillory's take on the Spirit of Detroit. 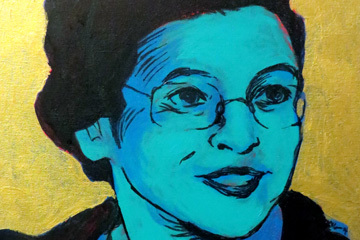 Detail of Kelly's portrait of Rosa Parks which exhibitied at Live Coal Gallery. The "Alumni" Exhibition, featuring one piece each from almost every artist who's gone through the Red Bull House of Art program. May 21, 2015 – September 6, 2015. A Tribute to Rosa Parks & Gilda Snowden at Live Coal Gallery. October 24, 2014 – November 25, 2014. Capture: A Dialogue Between Paintings & Photographs at Corktown Studios. February 15 – 22, 2014. 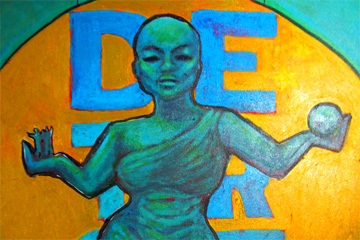 Alonso del Arte, "9 artists who live in Detroit", Examiner.com, January 6, 2015. Alonso del Arte, "Local artists succeed at Detroit Fanfare Comic Con", Examiner.com, October 26, 2013. Ashlie Dunn, "Student finds artistic 'icing on cake' through different mediums, avenues of expression", The South End, March 27, 2013.